Picture for a minute what you might buy after retirement, some reward for punching the clock all those years. Maybe, quite possibly, it’s exactly the same thing John Babinec bought for himself. First, though, Babinec test drove just about every nice car he could find. He wanted fast, and he wanted comfortable. Eventually, he settled on a Bentley. It was a three-year-old Continental GT Speed, a two-door coupe with an engine as powerful as three commuter cars. The interior is as lavish as a French chalet, and yet it’ll turn every highway entrance ramp into Beau Rivage – otherwise known as turn three in Monaco. Babinec’s condo gives residents just one parking spot, so he needed a place to store his prized ride. He also lives near the ocean, and in no way did he want sea spray making contact with the Bentley. So shortly after he bought it, Babinec pulled it into a loading bay at RoboVault, a futuristic storage facility in Fort Lauderdale. Then, as he watched on a TV screen in the next room, a giant robot arm picked up his baby and carried it away. When he wants it back, maybe once a week or so, he heads back to that same loading bay and watches the giant robot arm return that reward-for-a-lifetime-of-work back to him. “It’s like taking your favorite piece of jewelry out of the safe. When it comes down on that big robotic arm, it’s like something out of a Batman movie,” Babinec says. RoboVault has become the home base for serious South Florida car collectors. Nowhere else can the owner of a special vehicle tuck it away in a hurricane-proof bunker with help from a giant robot. The robot in question is called Lucy, a 70-ton robotic crane built for $5.5 million by German tech firm Westfalia. It operates in an industrial -looking room of concrete and steel beams, generally inaccessible to anyone except the occasional maintenance crew. Lucy stores the cars in slots that never see a human being, so there will never be as much as a finger smudge on an otherwise spotless windshield. When RoboVault first opened in 2009, the idea was to create a 145,000-square-foot storage facility for the wildly affluent. It was novel in the storage industry, using robotic technology designed more for warehouses and manufacturing. BBX Capital took over the $22 million property in 2013 and hired Universal Storage Group of Atlanta to run it. The facility now rents storage areas at prices that compare to typical – meaning non-robotic – storage facilities, says Francisco J. Garcia, RoboVault’s marketing director. “The difference for us is, you bring your baby to us, the car you love, and nobody’s going to put their fingers all over it. Nobody’s going to press their face against the window looking inside,” Garcia says. Aside from cars, people rent out pods for household stuff, which Lucy also tucks away into storage units. There’s a safe deposit room with fingerprint scanners and electronic keys, all feeling a bit like an impenetrable room from a Mission Impossible movie. Nearby is a meeting room for events, with a window that watches Lucy at work. In the back is a wine cellar, with spaces ranging from 26-case lockers to areas larger than most Manhattan apartments, kept always at a cellarlike 55 degrees and 70 percent humidity and backed up with a generator the size of a pool cabana. It’s the cars, though, that keep the RoboVault parking lot busy. 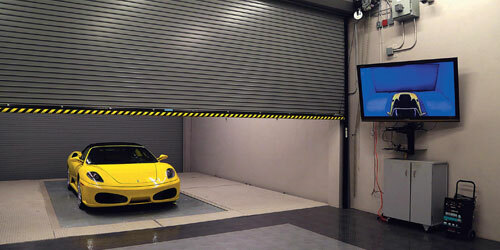 A storage unit for a car costs $360 a month, and they can hold 148 of them. Go on a sunny weekend day, especially, and you’ll likely see Lambos and Ferraris and a few exotics that have no match anywhere in the world. But then, that’s why we all work day after day, right? For that Saturday, with a Bentley parked up front at The Breakers, before a robot from the future tucks it into bed. 3340 SE Sixth Ave., Fort Lauderdale, 954-766-9997, robovault.com.